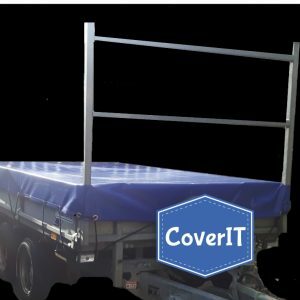 CoverIT is here for all your trailer cover needs. 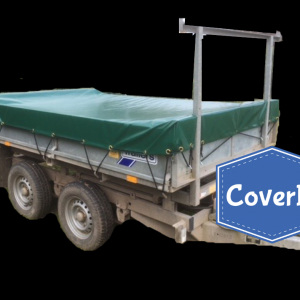 With high quality trailer covers at low prices and with free UK delivery, we have it covered..
We have a wide range of trailer covers for Ifor Williams, Graham Edwards and Caddy trailers. 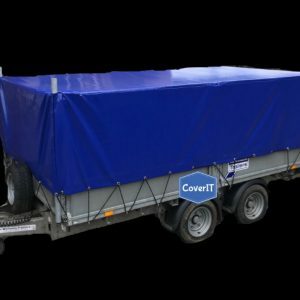 A custom made trailer cover service is also available if we don’t have a cover for your trailer type. We aim to Cover IT all! Why not check out our extensive range of covers using the menu’s above and also visit our gallery to see some examples of our covers. 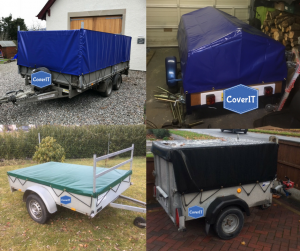 Please don’t hesitate to get in touch if you are at all unsure as to what type of cover you need or you want a bespoke cover making, Alternatively take a look at our trailer cover guide to help you determine what type of cover you require. email: sales@coverit.org.uk or alternatively use this contact us form. Each cover is made with high quality 610gsm tarpaulin and then sewn using UV resistant thread that will not rot. To many this will mean nothing. So hopefully a better explanation is this. It is the same fabric that is used on the side of HGV’s but where theirs is approximately 900gsm we use a slightly thinner version. The reason for this is that although we need the durability and waterproofing that the construction of the fabric provides, we also require the cover to be less rigid. This makes it easier for you to use your cover. The thread used to make these covers will not bleach in the sun nor will it rot from the rain. Leaving you with a cover that doesn’t have frayed white stitching after only a few weeks! 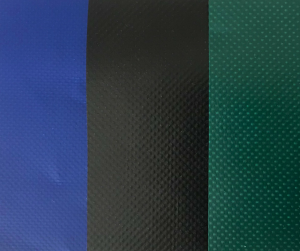 Every style of trailer cover is available in blue, green and black so that your trailer can look smart whilst still being protected. 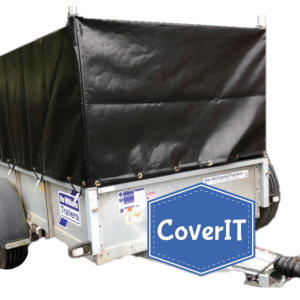 In order to secure your trailer cover whilst in transit we have added rust proof solid brass eyelets to the hems and supplied strong 8mm black shock cord as standard. The heavy duty shock cord is provided as one length for you to cut to your exact requirements if necessary. 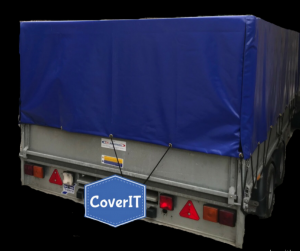 What makes CoverIT trailer covers special? 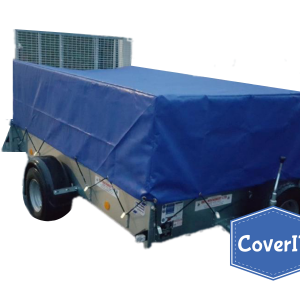 CoverIT trailer covers have quality, durability and ease of use in mind. Continuous hems are added around the whole trailer cover for standard or ramp tailgate trailers. This ties together each side of the cover to make it stronger at the corners. All ladder rack holes have tarpaulin binding around them. This will reduce wear if the cover rubs against the metal posts during transit. Opening back/front covers have velcro® that is self adhesive and is also sewn on down both edges. This means that over time there is no issues with the velcro® coming away. Any open side edges of the cover have tarpaulin binding down their length to again protect against wear. 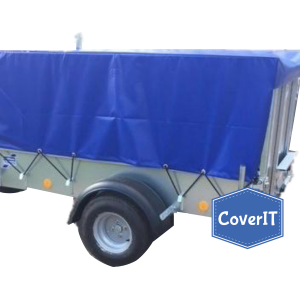 Our trailer covers have velcro opening fronts for standard trailers that have a ladder rack fitted. The front corners of the cover open allowing access to a slot for the ladder rack post to sit in. 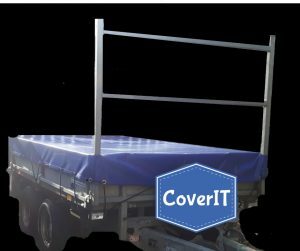 This excellent time saving feature lets you use your cover without removing the ladder rack. Additionally the cover fits tightly around the post. An opening front cover has the front panel on the outside with the two side panels folding round underneath it. When travelling, the force of the slipstream on the front panel will then keep the sides in place. The back panel however is the opposite way round. Therefore as the slipstream travels the length of the trailer it doesn’t rip open the sides. As a result of both the opening front and opening back construction these covers have the added benefit of allowing side or rear loading. Once the cover is on, it can stay on.